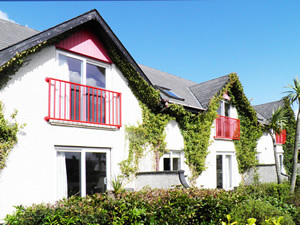 A modern apartment set within a Holiday Park on the edge of Ballycastle. The apartment is comfortable and fully equipped with Wi-Fi internet available at an additional cost. ItÃ‚â€™s in a great location to explore the Nine Glens of Antrim, Giants Causeway, Carrick-A-Rede Rope Bridge, Royal Portrush Golf Club and Dunluce Castle, which are all renowned for their natural beauty. The holiday park, which is open all year has its own indoor heated pool (Ã‚Â£4 per person) incorporating a water slide, communal laundry (Ã‚Â£4 per use) .The park also overlooks Fair Head, Rathlin Island and on a sunny day you can see Scotland.Shop. Pub. Restaurant 440 yards. Beach 1 mile. GF: lounge/kitchen/diner with sofa bed. FF: double, shower room.Electricity included , storage heaters, linen and towels included, fridge with small ice box, microwave, electric heaters, internet access, uk tv channels, open plan shared garden, shared driveway, off road parking, indoor swimming pool, childrens playground. Sorry no pets. Ballycastle is at Atlantic Coast, County Antrim. Check out the map below for directions, use the controls to zoom in.